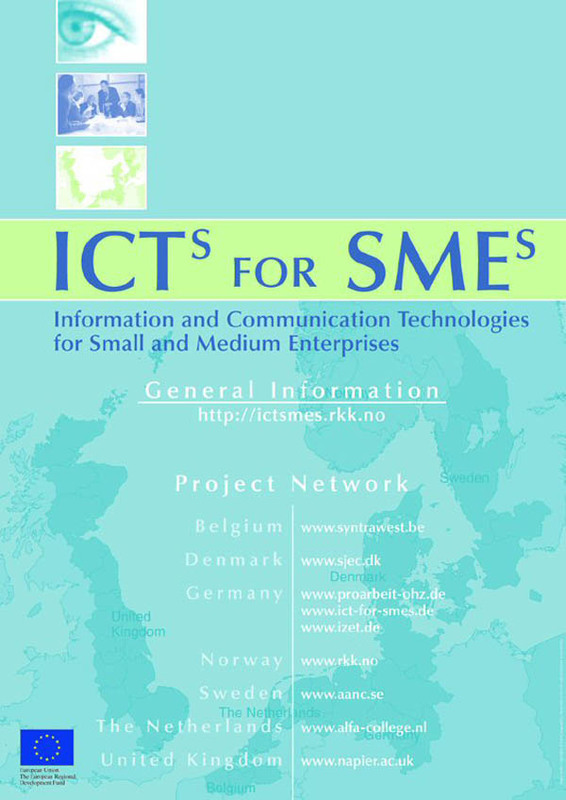 Main aim of the ICTs for SMEs project was the strengthening of the region by spatial and structural changes in order to form a balanced region. The tools to reach this aim were Information and Communication Technologies (ICT). The project worked towards enhancing the implementation and usage of ICT in SMEs. In particular the formation of a SME support structure was an important aim of the project. The project has achieved a high practical value. It has carried out hands-on activities that are demand oriented and has triggered tangible results by building the basis for infrastructure development (e.g. in Osterholz) and continuing activities in follow-on projects (e.g. in Scotland in the field of education for SME decision makers and ICT advisers) or deepening partnerships on common identified topics (e.g. between Norway and Belgium). A key activity carried out by the project was a survey which identified the regional technical status quo and the already existing Knowledge and skills of SMEs including 100 SMEs per region. Model practices for resolving spatial problems can be seen in the enhanced support to SMEs in rural areas which did not have the access to qualified support and information at least at this extend. One example from Germany was the creation of an industrial zone by wireless broadband. Thus a new opportunity to link up rural areas to the data highways and to create a better accessibility of these areas was shown. In the given case this connection also allowed a free of charge intranet between the connected companies and to companies in the neighboured city of Bremen. The project’s cooperation intensity was high and developed tools were transferred between the partners. For example, the partners from Belgium developed a web-based profiling tool for the use of ICT in SMEs which they have elaborated from analysing the interviews carried out in all partner regions and additional analytical work on this subject. The tool has been made available for the other partners as well. This is an example for using the complementary data, knowledge and competences available in a partnership and added value to an output through transnational cooperation. One of the main achievements was that most partner regions built up a sustainable ICT support structure for SMEs in the form of a sustainable, vertically integrated, sector-spanning network between SMEs, local authorities, providers of education and transnational partners. Thus SMEs were enabled to innovate and the use of ICT in general has significantly increased. In Osterholz, Germany the NETZ-Centre for innovative technologies will maintain the regional Support Centre and thus sustain the project outputs. The results have already proven to be valid with a great potential for future cooperation activities, thus potentially contributing in the long-term to a better business environment with regional socio-economic benefits. In Landkreis Osterholz, Germany broadband development has become a key priority in the county development strategy which is fixed in a new strategic programme for the county and the related municipalities and communes.